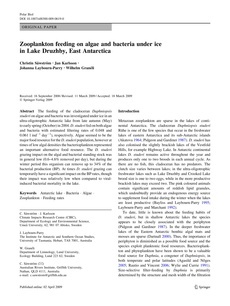 The feeding of the cladoceran Daphniopsis studeri on algae and bacteria was investigated under ice in an ultra-oligotrophic Antarctic lake from late autumn (May) to early spring (October) in 2004. D. studeri fed on both algae and bacteria with estimated filtering rates of 0.048 and 0.061 l ind-1 day-1), respectively. Algae seemed to be the major food resource for the D. studeri population, however at times of low algal densities the bacterioplankton represented an important alternative food resource. The D. studeri grazing impact on the algal and bacterial standing stock was in general low (0.6�6% removed per day), but during the winter period this organism can remove up to 34% of the bacterial production (BP). At times D. studeri grazing can temporarily have a significant impact on the BP rates, though their impact was relatively low when compared to viralinduced bacterial mortality in the lake.